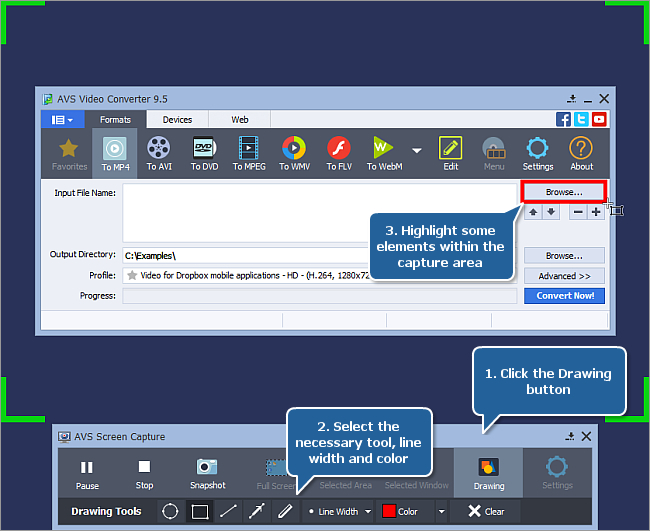 If you want to take a single screenshot of your desktop, to record a video call, to capture the process of playing a game, or working with a software application, or something else - any of these tasks can be easily accomplished using AVS Video Editor. The program includes a built-in video grabber that allows to record all the actions you perform on the computer screen within the selected area. You can not only grab video from your screen, but also enhance the recording by trimming your video, inserting explanatory captions, adding an audio track and much more. 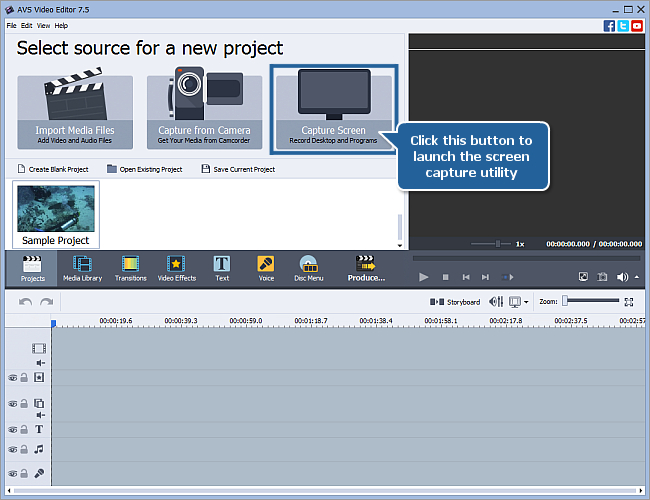 To launch the AVS Screen Capture utility, click the Capture Screen button at the Start Project screen of the AVS Video Editor program. Note: you can also use the Screen Capture button located on the left in the Media Library section or open the File section of the Top Menu and select the Capture Video from Screen... option. Full Screen - to select the whole screen for capturing. Selected Area - to select а specific area on the screen for capturing. Selected Window - to select one of the opened windows on the screen and capture actions within this window only. If you select a custom recording area, you can resize it by dragging its borders. Hover the mouse cursor over one of the green handles located in the corners and at the center of the area borders so that the cursor turns into a bidirectional arrow and drag it until the desired dimension is achieved. It's also possible to change this area location by dragging it to the necessary position on the screen. Hover the mouse cursor over the icon located at the center of the area and drag it to a new location. 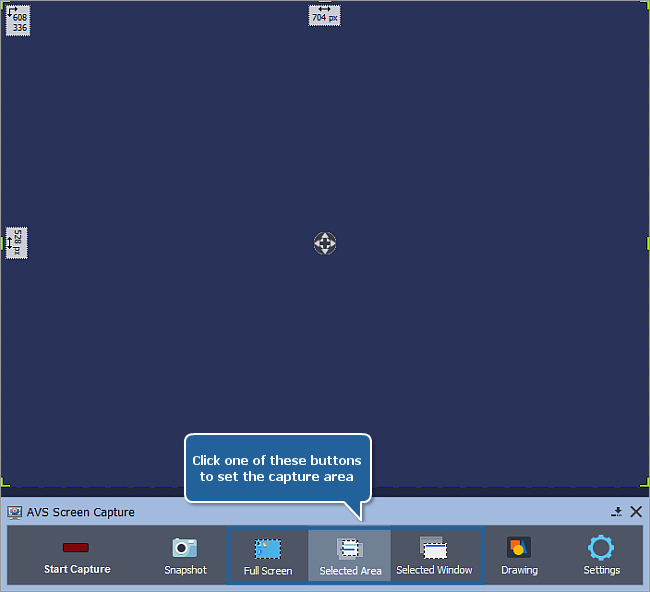 To take a snapshot, click the Snapshot button below the recording area or press the Ctrl + F12 key combinations and save the captured image file to your computer hard drive. To grab video from your PC screen, click the Start Capture button below the recording area and fulfill all the operations that need to be recorded. 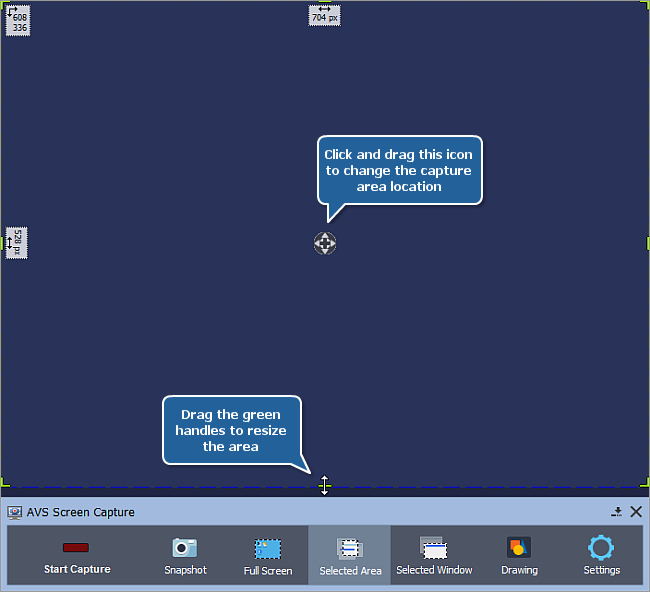 All the actions you perform within the capture area are grabbed by the AVS Screen Capture. To highlight a certain area or element you can also draw various shapes, lines and arrows of different colors and thickness during the recording. Click the Drawing button below the recording area, select the necessary painting tool and start drawing within the recording area. Press Ctrl + F11 to pause grabbing the video. You can also right-click the AVS Screen Capture icon in the system tray and select the corresponding option. Once you stop capturing, the viewer window automatically opens so that you can immediately preview the captured video. For your convenience, you can use the navigation slider and player buttons to manage video playback. If you are satisfied with the result, click the Save Video button below the preview area. You will return to the AVS Video Editor program, and your video will be placed to the Media Library. After you have enhanced your grabbed video, you can proceed to saving it. When ready, you will be able to easily share your screencast with others via social networks.